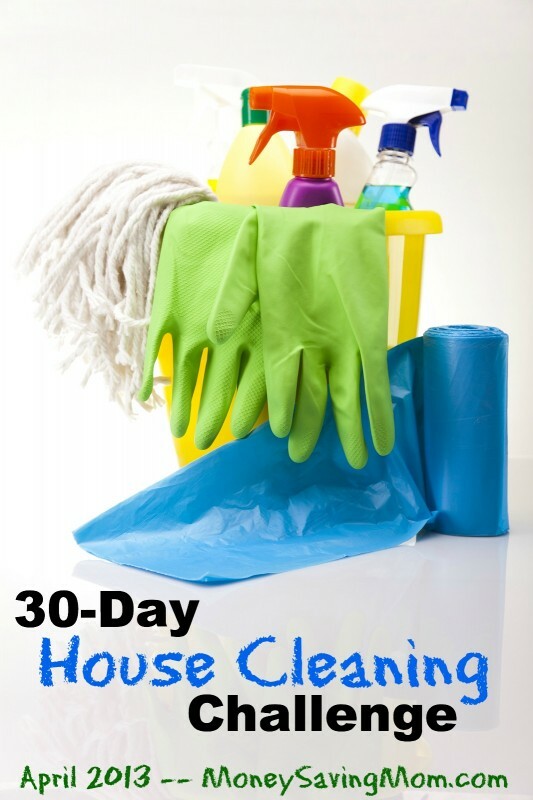 Come back here at 6 p.m. EST and I’ll show you pictures of my cleaning accomplishments for today and have a linky so you can link up yours, too! What project are you planning to tackle today? ::Want to blog about this challenge? If you’re blogging through this challenge with me, be sure to leave your link to your direct post on the daily check-ins. Plus, if you’d like to post your daily posts to the , just shoot me an email (moneysavingmom @ gmail dot com) and I’ll invite you. ::Want to follow along on Twitter or Instagram? I’ll also be sharing some of my cleaning pictures on , , and . I’d love to have you do the same or join in the discussion on Twitter and Instagram. Just follow hashtag #Cleanin30 to see what others are tweeting and Instagramming about this challenge! I’m going to be working on three closets today. The kid’s closets need to be gone through I know my son has some clothes that need to be donated and my daughter has such a variety of items in her’s it is hard to keep it organized. I will also straighten up the entryway closet. It’s not too bad but does need to be picked up a bit. The closets in my house usually tend to be the most unorganized areas in my home, because the clutter is out of sight, out of mind. The master bedroom closet needs some desperate help, so I’ll be working in there today. I think my linen closet could use some help but I actually think my pantry in the kitchen is what is most in need of my attention. I worked on the bathroom from yesterday and my entry closet today. The transformation is AMAZING! I got rid of a ton of stuff. Can’t wait to link up tonight! I want to tell you that I’ve been thoroughly enjoying this series. I haven’t followed the challenges, but your posts helped me stay motivated to complete my own goal. I’m very happy to say that, after spending approximately 100 hours working towards my goal since February, I have completely decluttered every inch of my home, and caught up on ALL of our laundry. Nearly nine years of accumulating “stuff” without a full home declutter among it led to a very cluttered and energy-zapping space. Thank you again for your continual inspiration and encouragement! Happy Birthday and congrats on all ur hard work!!!!! Cleaning up an inch of water in my finished basement today……not what I had planned! I’m going to deep clean our bedroom. It’s the one room that is sorely neglected and is the catch all for junk. Crystal, while some days seemed frustrating not accomplishing things overall I have gotten much more done! Thanks for the challenge. Then we will hang two hook rails, pictures in the laundry room, and redo a wall at the bottom of our stairs. While he worked on those things I was able to declutter the drawers in the kids bathroom and am now working on going through my closet/dresser! I love it!! It feels so great to be getting to things on a list that’s been around for months!!!! Plus I’m planning a garage sale so I need everything done and de-cluttered! Here’s my before. I just have to straighten the living room a bit. I clean the windows the other day but little toys tend to find their way in here. I quickly clean up here. I share my insight on how to do it. I like to have my house be cleaner, quicker. It’s a toss up between our master bedroom closet and our linen closet but I think I’m going for the master closet. Through the weekend I may surface clean a bit more. After tonight’s run to the grocery store, I’m in for the weekend. I’m so in the mood to stay in-doors and deep clean every room. It’s been raining for days here and I’ve decided to surrender to my nesting desire, make a pot of vegetable soup, put on my audiobook and clean! We did all 3 of these this weekend!